Lots of test equipment auction goodness from Precision Mechatronics who went into liquidation. And is it possible to mod a system PSU with binding posts? Agilent 6641A and 6643A DC system power supplies. You will always be able to beat a dealer at auction. They are never going to bid into their profit margins. They are certain to have a clear limit and will never exceed it. But they also have commercial clients who will pay top dollar for stuff, so they can often afford to pay more than you think. Could I have the Windows scope? Pro tip, do not run my commands! The yellow banana will have trouble fitting into the cutout on the system supplies !! . Seriously some nice gear but seeing the inside of the system supply was the real highlight of the video, what a thing of beauty. I now want one, damn you . Guess I will wait for your auction of the excess stuff, (dont you still have gear from the previous 'auction score' ?). It's great that you got these deals, but I hate to see manufacturing companies going out of business. I have an HP 6622A System DC Power Supply (Dual Channel, 20V@4A or 50V@2A). It has the same type of terminal strip on the back as your 6641A and 6643A units. When I got it, one of the channels was dead because the terminal strip had broken the solder joints. I was surprised to see such a poor quality terminal strip on a piece of HP equipment. What were they thinking when they specified terminal strips that aren't bolted to the board? 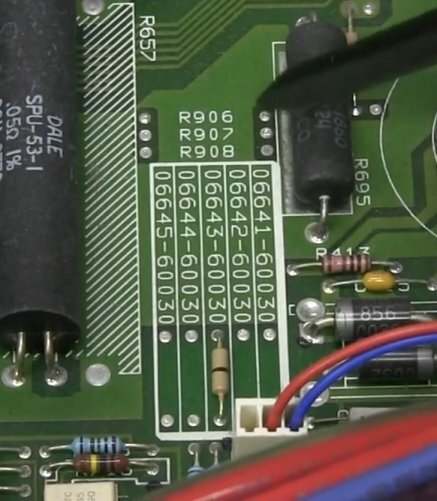 Am i the only one to notice that there's EEVblog #656 and #654 but there's no #655, or is it somewhere else ? Video gave me blue balls. Could these jumper links be the only difference between the 6641-6645 models?, and the different features are just software limited? I want to know too! Dave - you have your marching orders! let us know when you pop them on ebay! if i recall, there is or was a link to ebay on the old alternatezone website. Would be interesting to compare if it's same to mine. Looks to me as if these jumpers are only for identification of the model. They are R901 to R905, located on the buttom right side of the circuit diagram on page 165 of the Service Manual (Figure 6-5). According to the diagram they are only connected one-sided to +5V. Why is there a banana on the stack? why do you need so many repeat units? Ive been trying to slowly refit my workshop with better equipment, When this auction came along my heart was set on it. I ended up not being able to bid on anything due to some weird techinical issue with online bidding. frustrating. Can you give us a rough idea of how much you paid for this stuff at auction? I've never come across equipment auctions like this in the US .. .I'm sure they are there, but finding out about them is the tricky part. It was 5 PSU's in one lot. Yes. I haven't looked in detail yet, but I suspect it sets the voltage and current limits (and associated encoder resolution) in firmware. So you might be able to eek out some extra performance, but surely the transformer has to differ in each model. You are going to teardown that scope i assume..